I pressed my face against the vents of my high-powered HEPA and carbon air filter to block out fumes of asphalt, laundry and paint. Wzzzzz Wzzzzz the filter whirled, calming my nerves as my lungs fought for air. Uhhggghhh, Uhhhgghhh. After swallowing my third double dose of Benadryl that night, my throat loosened and air eased down my trachea into my lungs. Ahhhhhhhh. “Mommmm!” my one-year-old boy called from upstairs. I dragged my aching joints up the stairs. Several months before, I had developed muscle weakness and nerve pain when the shopping mall across the street and three houses in our cul-de-sac were renovated. My symptoms quickly progressed to hives and asthma when exposed to a wider range of chemicals, including natural gas, pesticides and fragrances. Shhhhhh, “It’s going to be all right,” I told my son. “Somehow.” I propped him up and stroked his soft brown hair as he fell back to sleep. Something inside told me to search for green. I pulled down the Atlas of the United States from the bookshelf, opened to Southern California and looked for the biggest patch of green in Orange County. It happened to be Cleveland National Forest and the nearby town of Silverado. Googling homes in Silverado brought up one house for sale: a large blue-grey Victorian nestled in the Santa Ana foothills. Scrolling through the pictures, I admired the bronze front porch columns, multiple roof angles and the horse and carriage weathervane. The next day our family left Laguna Niguel to see the house. We pulled away from our monotone stucco and tile roof rental home taking up most of our tiny lot. 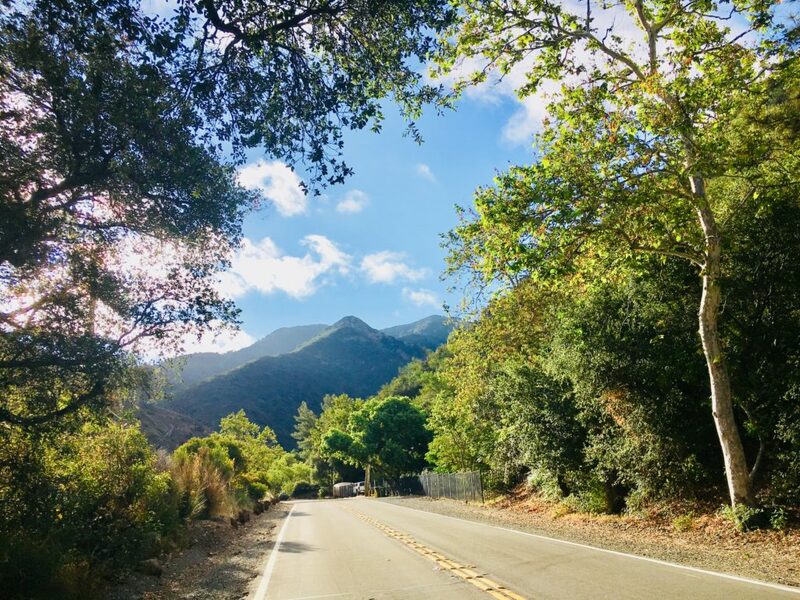 I kept our windows closed with the air conditioning re-circulating as we drove down four-lane roads lined with wispy California Peppercorn and pale Eucalyptus trees. Beyond the thin veil of branches, row after row of houses, condos and stores with the same tan and rust color scheme extended endlessly over the rolling hills. Twenty-five minutes later, we turned onto Santiago Canyon Road where white sage and burnt brown buckwheat bushes appeared more and more between housing communities until civilization disappeared and only jagged clay canyons remained on either side of the two-lane road. We veered right at an evergreen farm onto Silverado Canyon Road. In the basin of Silverado, we rode through the rustic town center with its post office, general store and tiny restaurant before winding up the twists and turns of the canyon. Diverse homes surprised us around each curve: wood log cabins, a dome house and revised barns. Whhheeee, our little one squealed from the back. I opened the car window. 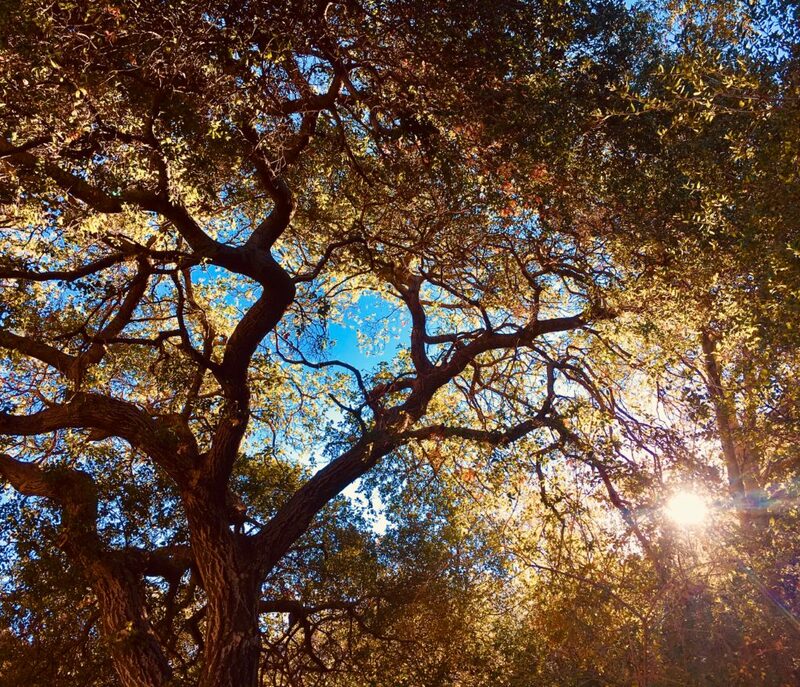 A breeze, moistened by the Silverado Creek and filtered by the large, five-pointed star leaves of sycamore trees and the small, thorny evergreen leaves of live oaks, filled my lungs. Whoooooosshhhh. “This is the perfect place for a mountain retreat,” I told my husband, as we pulled up to Victorian home. The area reminded me of my favorite childhood vacations in the Appalachian Mountains. The architect who redesigned the house showed us the creek flowing along the back. Only a few young live oak saplings broke up the gravel ground cover. “Plenty of room for you to design your own landscaping,” he said. He ushered us inside and led us up the polished oak stairs. Light streaming through the skylight highlighted the shiny dark bannisters and accentuated the grooves of the exposed beams. The steepness of the stairs increased as we climbed to the third floor. Opening a creaky door at the top, we stepped onto the walkout roof. Wowwww, my son exclaimed. The tall hills rose around us into the low hanging clouds while the stream gurgled softly below. “Don’t you worry; I have a good imagination,” I replied as I envisioned another possible future. In this one, my husband and I sipped red wine on the roof while the sun set behind us on the mountain ridge. When we opened the front door to leave, a neighbor sitting on her porch across the street waved and came over to greet us. Too much riding on this decision, I thought. The day after we moved in, I heard a knock at the door. My neighbor from across the street stood before me in a denim skirt with her long gray hair pulled back into a ponytail. Her arms cradled a very large bag. “I’ve been working hard this week,” she said. Like a country magician, she pulled out a flannel quilt for my son, a hand towel embroidered with a design of our weather vane, a jar of homemade peaches and an ink block print card. My new life unfolded with relative ease. Several times a week, I pushed my son’s stroller up Silverado Canyon Road into Cleveland National Forest. Not only did my lung capacity expand during my walks, but I also met local artists and colorful characters and began to find my place in the community. I planted organic herbs, berry bushes and heritage fruit trees in our backyard. We mulched around the outskirts of the trunks, pulled off dead leaves, watered more during summer droughts and chased off the squirrels. Somehow, despite my lack of experience, most of the plants survived. Yaahooooooo my son shouted as he ran around the growing trees and up the dirt piles. I dropped crushed mint and basil from my backyard into quarts of drinking water, sprinkled sprigs of our lavender and rosemary into my bath water and stirred my chopped thyme and sage with produce from the farmer’s market to make my own recipes. As the months transformed to a year then two, I found friendships, renewed creativity and a larger sense of purpose. Another local mom and I formed a small outdoor playgroup. I wrote articles on mommy blogs about outdoor programs and composed nature inspired poetry and stories. And one magical twilight, when ribbons of magenta and crimson intertwined, my husband and I sipped Conundrum wine alone on the roof while a red tailed hawk performed an aerial dive show for us. Two and half years after our move-in date, an artist friend from the East Coast visited us. “You have the best mountain retreat,” she said over dinner. Later, my friend and I hiked up the road toward the entrance of Cleveland National Forest. A little out of breath from the climb and the summer heat, we paused at a ravine where the green foothills faded into blue mountains and sky. “You should come up here with an easel and do some plein air painting,” she said. We laughed as we improvised breathing techniques. Wzzz Wzzz. I breathed out memories of my face pressed against the air filter. Uhhhgghhh. I breathed out memories of my fight for air. Shhhhh. I breathed out putting my son to sleep the night of my worst symptoms. I let all the painful memories go. Whooshh. 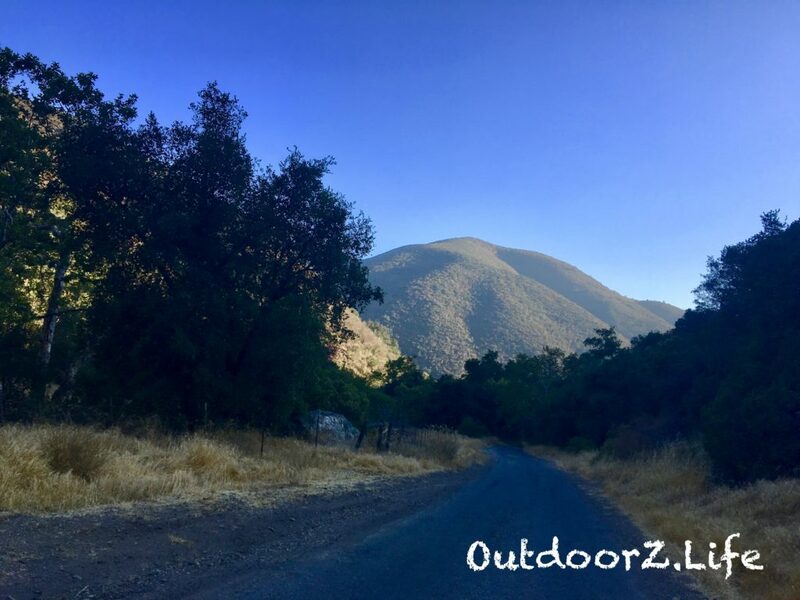 Fresh mountain air kissed the filmy clouds, flowed over the dry river bed, wound around the peeling cream and charcoal bark of the sycamore trees and gnarled arms of the ancient live oaks and swooped into my lungs. Wheeee. I absorbed all the new memories of walks into the wild, caring for my young orchard, creative ramblings and new friendships. I realized how much stronger my lungs and body had become since the move. With all the fresh air, walking, exercise and organic food, I had lost twenty pounds. And my reactions occurred less often and were generally less severe. Most importantly, I had learned to trust my intuition and that faith plus hard work in nature could yield surprising results. Ahhhhhh. I breathed in peace. Perhaps I fled crowded suburbia out of desperation. However, my move to Silverado, opened up opportunities for me to grow healing plants, gather strength from a nurturing community and restore my health. Yahooo. The photos are stunning companions to the article which is, literally, a breath of fresh air. Great personal story of a life-changing turn toward nature. Thanks Sandy. We couldn’t agree more…we were thrilled Kristine shared her story.